The bonds that develop between animal companions and their human families are not easy to define. Each relationship has its own unique dynamic, and yet, a common thread has become apparent to me. Just as I believe each person in our life is drawn to us for a reason, I firmly believe we share our homes with our animal companions in a similar way. They come to teach, to guide, to illuminate and inspire us in ways we cannot begin to imagine until we have experienced them. 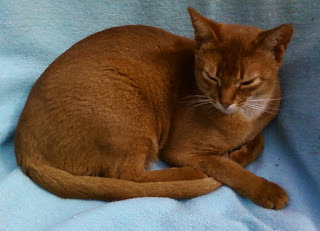 Sahara was an Abyssinian cat that lived with me for a while. She was 12 weeks old when I collected her, by car, from a breeder in Durban North. I had taken 6 months to make the decision to get another cat after the very traumatic death of my beloved Pumpkin (that is another story!). The breeder, like so many do, kept her cats indoors and Sahara had never been exposed to the world outside. So, when we finally arrived home, after the lengthy car trip, and my husband opened all the car doors, and then the door to the carry cage, I expected the worst. Her whole experience to that point of time must have been extremely stressful. As far as I was aware, Sahara had never been outside, let alone in a long car trip. I did not know what to expect when she was faced with my dogs or the limitless freedom of the ‘great outdoors’. To my astonishment, Sahara did not bolt, or hide, cowering under the vehicle. In fact she acted as if she had been to our property before. She walked around the plot to very specific spots, inspecting and checking things out. And then she marched right into the house. There are a number of buildings on our Benoni smallholding, any one of which could have been chosen, but she just ‘knew’ where she would be living with us. And so, our relationship began... Only someone who has been gifted with the lavish, demonstrative affection of a cat will understand what it is to be claimed as a cat’s special person. I was Sahara’s special person. The way she quickly settled in (and took over) was more than enough to convince me that Pumpkin had returned to me, in Sahara’s form. 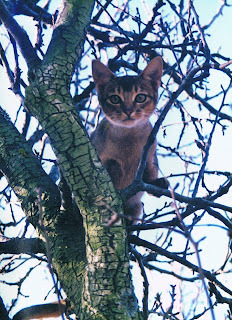 When Sahara (also known as ‘Cat’) was three years old, my husband and I went to Europe for two weeks. In our absence, Sahara strayed from home. One morning, our neighbour saw her lying on our pavement. When he noticed that she was still there that afternoon, he called our son who rushed her to the vet. Sahara had been struck by a car in the road outside our house, and, in spite of being paralysed in her hind legs with a broken back and having one dislocated elbow, she managed to drag herself to the side of the road and onto our pavement. The tenacity, hope and trust that she showed in that single act almost broke my heart. She was gravely injured, and yet still, somehow, made her way home where she knew she had always been safe. Nine long days after the accident, I came home to hear the devastating news. I immediately took Sahara to my colleagues at Onderstepoort Veterinary Academic Hospital where she underwent a CT scan. Her third lumbar vertebra was fractured and there was a chip of bone in her spinal cord. It was inoperable. The advice from the specialist surgeon was to take Sahara home and see what would happen. Cats are known for their amazing recuperative powers, and he suggested we give her four weeks, and then try anything and everything we could to help her heal. I did exactly as the surgeon suggested, and so another stage in my personal and professional journey began. I had recently started my animal rehabilitation and pain management practice, and I passionately applied everything I had learned in my new practice to treating my beloved Sahara. I used acupuncture, massage, photodynamic (light) therapy and performed many range-of-motion exercises. I added Crystal therapy and Reiki and even asked my Wiccan friends to cast healing spells. After three days of being treated at home, my precious Cat stumbled, unaided, through the cat flap to do her business. Sahara improved daily. After six short weeks she caught (and promptly consumed) her first pigeon. She walked with a strange gait but was mobile, happily interactive, and appeared completely pain free. When I took Sahara back to Onderstepoort to show her to the surgeon and radiologist they were amazed. In fact, the radiologist often includes Sahara’s CT scan in his presentations to this day. Three months later, Sahara disappeared again. I searched for her and called for her for eight heartsore days. It was so unlike her to wander when I was home. I printed flyers, visited all the local vets and the SPCA – but to no avail. Then, on day eight, I found her decomposing body under a tree, outside my Reiki/Healing room. Sahara lay peacefully, without any sign of external trauma. It is my belief she may have suffered an embolism which is a fairly common complication after the type of trauma she had suffered. It is also my belief, that it was her time to go. What did Sahara teach me? 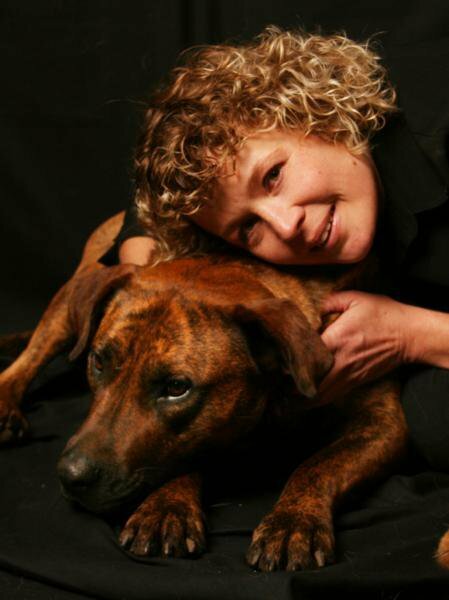 She gave me the confidence to use my newfound skills, and reinforced my belief in the therapies I had adopted in preference over mainstream veterinary services. Her gift to me? You can do it, these therapies can make a significant difference, and never discount anything – use whatever is available, provided you do no harm. Life is a cycle. We are born, we live, we die. The earth revolves around a cycle: spring, summer, autumn and winter. The cycle continues despite our best efforts to remain in one part of the cycle. Our lives can be broken down into smaller cycles. We go through phases of conception, where new ideas are born and explored. Then we are energized into action and these plans become real. This is often a frenetic, exciting time as we watch our creation grow. If we are fortunate, this plan becomes a creature in its own right and may branch off with its own creations, or it may move along at a comfortable pace. Once this phase is reached we should reap the fruits of our labour. Sit back and enjoy the creation. With time, this creation will no longer serve us - the world changes, and so do we. We should embrace this end and peacefully allow this phase to move along and transition into death or winter. New thoughts and ideas will be bubbling just beneath the surface, waiting for expression. Allow it. Too often we want to hold onto a 'good' thing when it has served its purpose. We should, rather, gracefully let it go. So it is with physical death. As humans, we need to find some belief regarding what happens after death. This will bring us comfort when the time comes for death. I attended a funeral of a good friend. The pastor was specifically speaking to the children (my friend had three young children) when he said that when a person dies, it is as though they are in the room next door. We cannot see them, nor hear them but our loved ones are present. I hold on to this thought. My loved ones (human and animal companions) are not dead. They have merely transitioned into another plane and have begun a new cycle. When my mind removes the restriction of a physical form, I realise that they are, indeed, right next to me. If I focus on what I remember of their essence, I can feel them. I surrender into this space and once again share with my beloveds. This affords me great comfort, and I know peace. Not all love stories are obvious. Nor do they all follow the same script. Some, even, have endings that we can’t fully appreciate or understand, but they touch us. Some even give us a glimpse of a picture bigger than we dared imagine. Doggie came into Siobhan’s already full life, starving and feral. After many months of feeding him every day, in the veldt, she was able to coax him into her car with food. Once he was living with her at home, in a space of unconditional love and unstinting devotion, Doggie and Siobhan became the soul mates they were destined to be, and he never disappointed her. Doggie’s physical condition was such that he needed a number of operations to his knees. And from these surgeries Doggie developed osteoarthritis. Every week, for three years Siobhan brought Doggie to my Hydro for light therapy, stretches and a swim. During that time the extent of their mutual love and devotion became more than apparent to me. Sadly, in spite of their hard work, nutritional supplementation and therapeutic vigilance, Doggie’s condition worsened and the osteoarthritis spread to his hips and elbows. Undaunted by the cost, both financially and emotionally, Siobhan took Doggie for stem cell therapy. The results of the treatment were disappointing. Soon, Doggie was reduced to taking only 3 steps before having to lie down. It seems like yesterday when we said good bye to Doggie. Again, he did not disappoint Siobhan. In spite of the high emotion, he understood, and he left us calmly and peacefully with love and dignity. Sometimes, the greatest love we can show our dearest companions is the gift of freedom from pain and suffering. Our deepest instinct is to hang on to life, no matter what the cost. We are afraid of losing our loved ones, and of being left behind without them. It takes great courage and personal sacrifice to let go. Veterinarians are the only professionals who have the right and duty to kill their patients. Having said that, I hold it as a precious privilege and honour to be chosen to help a sick, old or pain ridden patient across the threshold into what lies beyond. As much as Siobhan saved Doggie, Doggie saved Siobhan with his unquestioning loyalty and total commitment to her. This is my tribute to a devoted lady and her very brave companion. I am blessed to have been part of their journey. Sometimes... we catch a glimpse of a departed loved one in the eyes, or hands or smile of a stranger. Siobhan recognised a dear friend in a starved, fearful, feral dog she noticed on the side of the road one day as she was driving to work. I wholeheartedly believe that death is not an ending, but rather a beginning, and I wonder if Siobhan and Doggie will find each other again, if not in this life, but in the next.